The bedrock consists primarily of various sedimentary rocks of different types and ages. The exposed rocks represent formations from the Silurian Period through to the Triassic Period with a little superficial drift on top. These sequences were intruded by basic igneous rocks about 307 million years ago. 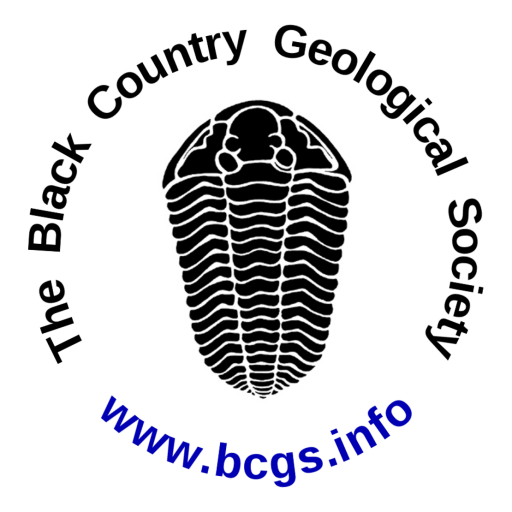 The geology of the Black Country has fundamentally influenced everything here, including the culture of the people who have settled these lands. The richness of the mineral resources made this a very early centre for mining, and directly led to the industrial revolution beginning in the Black Country. Modern iron making began in Dudley with smelting using coal; a process invented in 1619 by Dud Dudley, illegitimate son of the Earl of Dudley. Subsequently, knowledge was passed to Abraham Darby (born at Wren’s Nest in 1678) who took the technology forward at Ironbridge Gorge in Shropshire. The oldest rocks outcropping in the Black Country are the Silurian Much Wenlock Limestone Formation, approximately 428 million years old. These were lime-rich sediments deposited on a shallow shelf seabed. The area was perhaps 30 degrees of latitude south of the equator in a subtropical climate. Variations in the amount of derived material from the land created fluctuations in the rocks that formed, ranging between hard crystalline limestones when detrital sediment supply was restricted, to muddy calcareous shales and siltstones when terrigenous sediment supply was greater. Sea level changes, local tectonics and nearby volcanism all influenced the rocks that were forming at this time. This period of alternating sediment supply was succeeded by a period of more consistent terrigenous sediment input known as the Ludlow Series. ‘Bone beds’ containing the remains of very primitive land plants and animals occur in a few locations from this period, and these are thought to be deposits of material stranded at the water’s edge and/or winnowed by the waves in shallow waters such that the organic remains are concentrated in a few centimetres of sediment. At the end of Ludlow times a regression of the sea occurred in response to the earth movements of the Caledonian Orogeny. This is evidenced to be of late Silurian age in this area. Rising land resulted in greater quantities of coarser grained sediment being generated from the land and transported to the land margins, where they were deposited by faster flowing streams and rivers. Here they built sandbanks and delta front cones of sediment. These sediments sometimes contain the remains of fresh/brackish water bony fish such as Hemicyclaspis murchisoni. The area was then subjected to gentle uplift, folding and erosion about 380 million years ago before deposition began again in the Middle/Upper Carboniferous times and the onset of truly continental conditions. This was the time of the Coal Measures. This area lay at or about the equator. The gentle hills had been eroded to a low level once again and the low lands were fringed by wide muddy flats, swamps and deltas which became hosts to vast tropical swamp forests. Sea level again fluctuated and a rhythmic type of deposition in the low rates of sediment influx allowed the accumulation of large thicknesses of vegetation to build up. These would eventually become the coal seams. Fine sediment trapped in the channels, rivulets and on mudflats would become the fossil soils and fireclays, and in stagnating areas of the swamp the deposition of ironstones occurred – all of which would become so very important in our industrialised days. Unique in the UK is the great South Staffordshire Thick Coal which in fact is up to 12 smaller seams which coincide to produce a single seam up to 12m in thickness. Also unique is the sheer number of mineral seams in less than 150m total thickness of Coal Measures sediments (with 12 coal seams, 12 ironstones and 14 fireclays packed closely together). As this area was nudged ever northward by the movement of the plates, the swamps became lifted and better drained. The seas regressed and the area became ever more land locked. Red silty marls formed in inland floodplains. Occasional floods cut river channels across these plains leaving sinuous and sheet like bodies of gravel and conglomerates in their passing. These are the Espleys of the Etruria Formation. For a brief period the land underwent stretching extensional tectonics, which depressurised the upper mantle and allowed basaltic magmas to rise up and intrude the rocks that had been deposited up to this point. In at least one location these magmas burst through to form minor phreatic steam vents and cinder cones. Remnants of one such cone can be found in exposures surrounding Barrow Hill in Pensnett. Following a short period of compressional tectonics and uplift in the south of the Black Country in late Westphalian C times, erosion occurred and gave rise to a thick sequence of sandstones (the Halesowen Formation). These are believed to have been deposited in river deltas and lakes. The succeeding strata became red once again, and being fine-grained mudstones with local development of conglomerates and calcareous cements, this suggests a return to better drained conditions similar to those of the Etruria world. Succeeding strata are much coarser and reflect a period of more substantial uplift and erosion. In early Permian times a coarse-grained breccia – the Clent Breccia – was deposited at the foot of steep mountain sides in a series of overlapping alluvial fans. The mountain fronts rising along geological faults divided the land into a series of inter-mountain basins and mountain ranges now far inland from the nearest seas. Consequently the climate became very dry, and desert or semi desert conditions dominated. Wind blown dune sands of the Bridgnorth Formation testify to the harshness of that environment. The final phase of significant deformation occurred after the Triassic Period and resulted in the down-faulting (graben faulting and formation) of the Triassic rocks to the east and west of the Coalfield block, and no evidence of deposition of further Mesozoic or Tertiary systems is present. Therefore either it never happened or they were long since removed by subsequent periods of erosion. The final phase of this story is the most recent 500,000 years when the area has been subjected to the scouring action of two ice sheets advancing, melting and retreating with landforms reflecting the erosion of the meltwaters and the uplift of the land by isostatic adjustment after the ice sheets were gone. Today most traces of the mining and heavy industry are gone but if you look more closely at the urban area many sites are still present, and some of the UK’s greatest geology is still to be enjoyed.